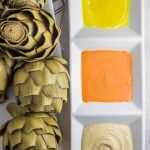 Artichokes – love them, hate to make them. I understand this all to well, but now making artichokes has never been easier. 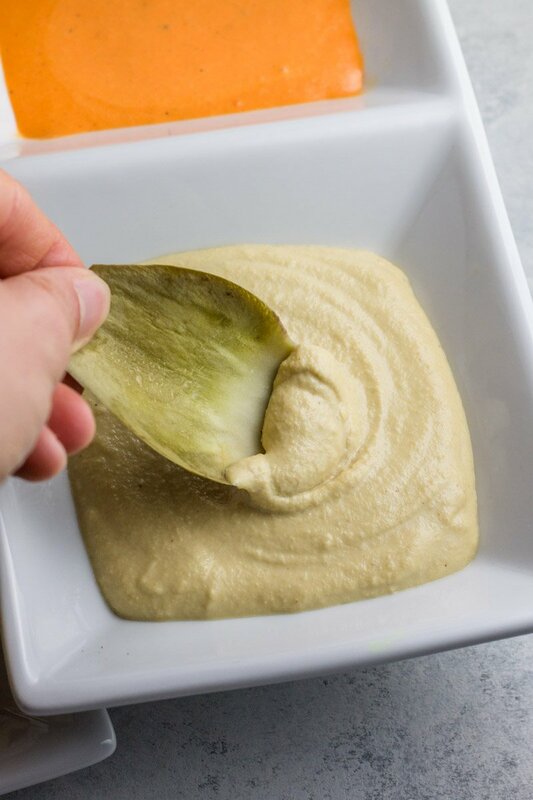 Honestly, you won’t believe how amazing these Instant Pot artichokes with 3 paleo dipping sauces are, and how easy it to make them. This is an artichoke game changer. Artichokes are those beautiful specimens I see in grocery stores that are so beautiful, so delicious, but also so puzzling. RIGHT?! Like, you know you want to dive right in, but you aren’t quite sure how to make them without ruining them. So you buy the canned ones but it’s NOT the same (trust me). Especially compared to fresh artichokes from Ocean Mist Farms. Then one day you try a whole artichoke at your favorite Italian restaurant (wondering how the heck they make them so tasty). Do you steam the artichoke for like 36 hours with some fancy steamer set you got as a wedding gift but have never used? Do you set it out in the sun and hope it naturally heats and lets off some amazing chemical reaction to make the leaves oh so beautifully soft and pluck-worthy? Do you leave a few on your counter for 3 days just hoping a miracle happens and your mom swings by and says, “oh honey, I’ll whip this up for you, and watch the kids as you take a bath”. No, that’s not what you do (and good luck getting that bubble bath). 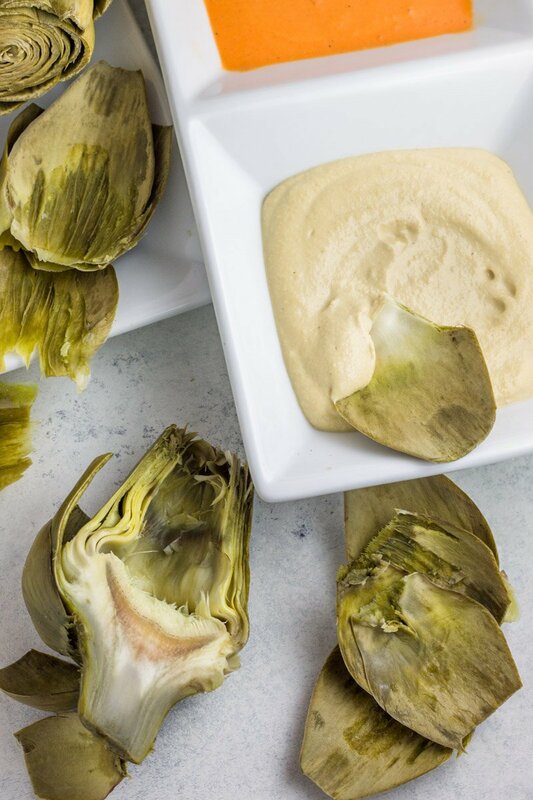 You make these Instant Pot artichokes with 3 paleo dipping sauces and marvel at how awesome you (and fresh artichokes) truly are. No Instant Pot? WIN ONE! Ocean Mist Farms is hosting a giveaway between now and June 22, 2018, giving away an Instant Pot and a whole loot of amazing kitchen and artichoke goodies. And not one, but 18 winners will be chosen. Click HERE to enter. Guys, it isn’t hard to make artichokes. Whole, fresh artichokes. 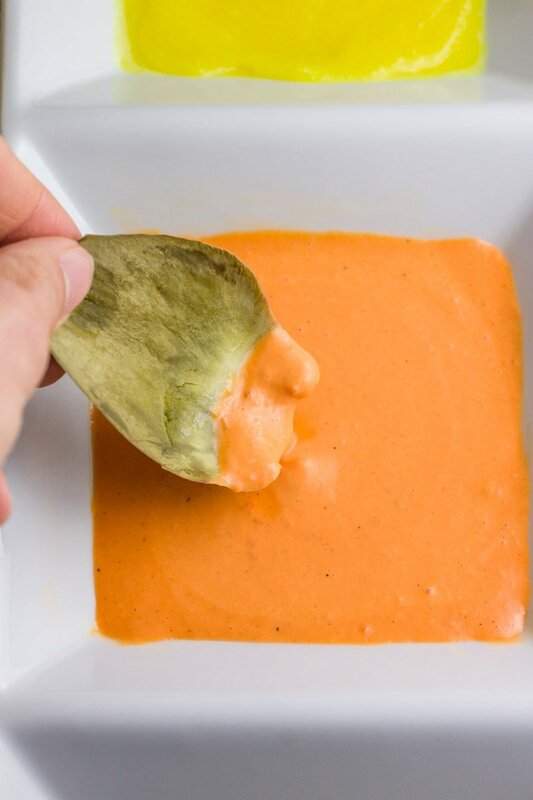 And when you pair them with three paleo (AND Whole30) dipping sauces, the possibilities are endless. 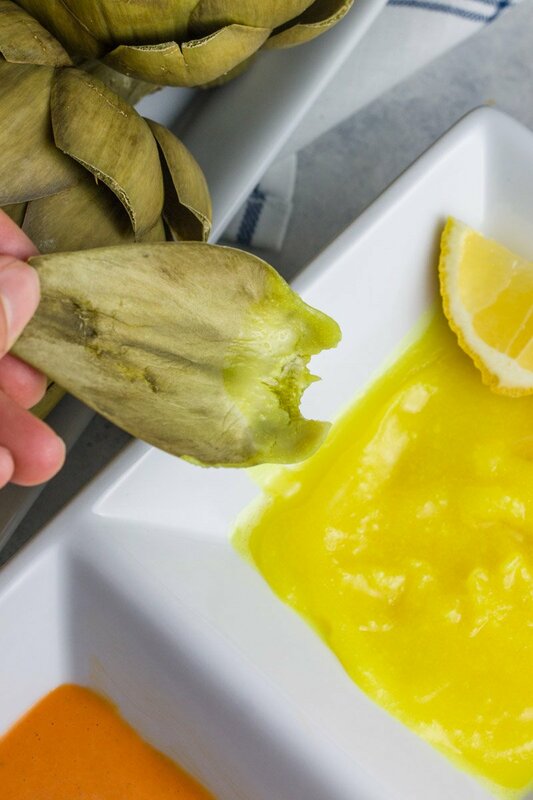 Just picture hosting your next shin-dig with a massive platter of freshly steamed artichokes and a three options for some mega dipping action. You best believe your friends and family will be flippin’ amazed at your rad kitchen skills. Lemme tell ya how easy it is. Just cut the top off the artichoke (about 2 inches off the top), and chop off the stem too. Then using kitchen sheers, snip off the top of each leave (those babies are pointy and sharp). Next, throw those ‘chokes in your Instant Pot! Fill the pot with 1 cup of water and place the artichokes cut side down on top of the trivet. Pressure cook on manual mode for 10 minutes then flip the top valve to manually release the pressure once the 10 minutes of cook time is up. RIGHT?! SO EASY! 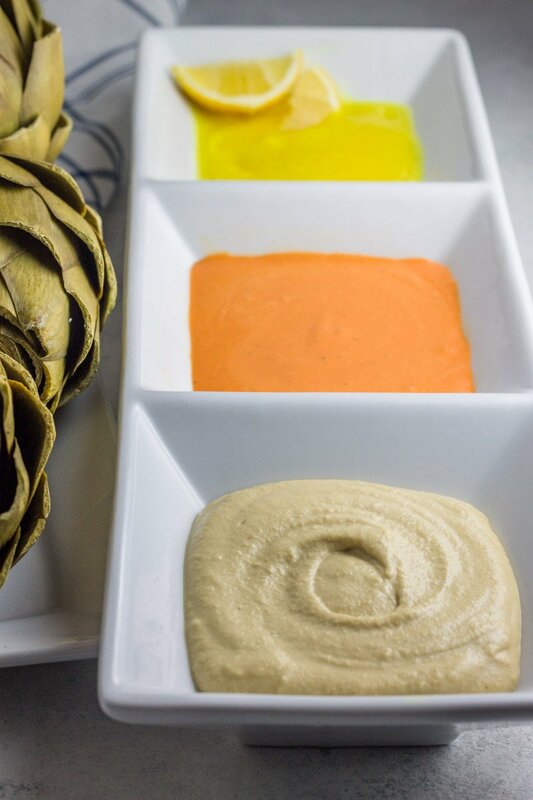 While you’re cooking up those fresh, delicious, Ocean Mist Farms artichokes, you must whip up these simple dipping sauces too! Let’s talk about the main event here. The star of the show if you will. Of course I’m taking about the ARTICHOKES of course. 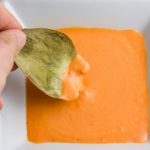 Here’s how you make them with ease in your Instant Pot! Are you convinced yet? Are you ready to take fresh artichokes to a whole new level. 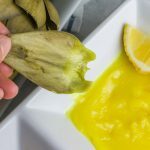 I am still stunned at the ease of making Instant Pot artichokes with 3 paleo dipping sauces and will throwing it all together for all my get togethers to come! Using Ocean Mist Farms fresh artichokes as become a staple in my house, and now yours too! Don’t forget to enter the giveaway for a free Instant Pot and a prize pack of kitchen goodies and fresh Ocean Mist Farms artichokes HERE. Artichokes, the love of my life <3 Seriously, I've been making these tasty, tasty globes of deliciousness for years!!! Steaming them, microwaving them…there is NOTHING like a fresh choke dipped in some lemon butter (in the years past). Personally, I think those stuffed ones at the restaurants take away from the fresh goodness of the artichoke. 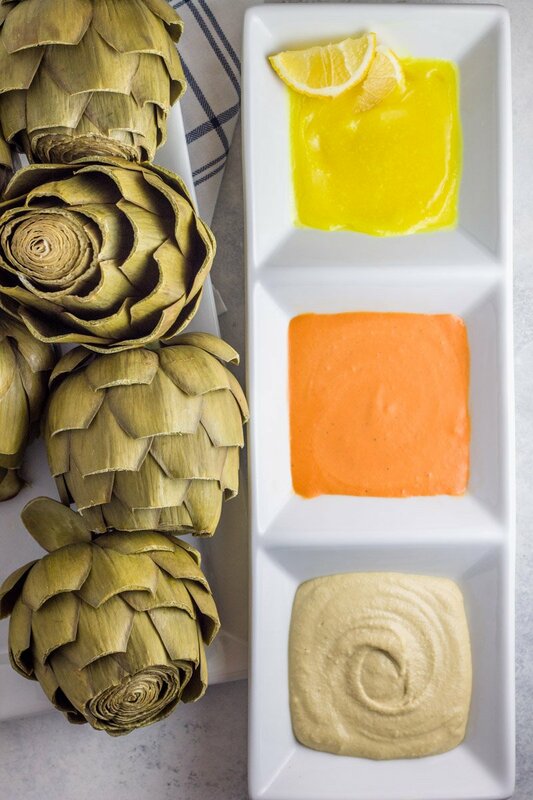 Can't wait to try your sauces, and to use my Instant Pot for the artichokes! Thank you for this!! Ok…I’ve tried the artichokes in an instant pot for ten minutes & I don”t khow anyone else likes or eats their artichokes but that was the toughest & hardest artichoke ever. It was horrific!! Is it something I did wrong ? I did everything according to this & also other recipes & nothing is as good & tender as boiling or steaming it for at least 35 minutes !!!! Oh no!!! I’m not sure! Every time I do this they fall apart and are so tender for me! And all the settings were correct? (manual pressure cooking, the release instructions, etc)? I’m stumped why yours didn’t turn out!